“Open-ended customization” is what unconventional watch company Ochs und Junior promises. This boutique brand located in Lucerne, Switzerland is the brainchild of the legendary Ludwig Oechslin (creator of the Ulysse Nardin Freak and other constructions as well as former curator of the Musée International d’Horlogerie) and Beat Weinmann (previously the manager of Embassy Lucerne). I am a passionate watch enthusiast and have been for years, as well as a watch collector (as far as my budget allows). There may be readers who remember me from The Purists (which is how I know Ian, GaryG, and Elizabeth), and others might know me as a commercial photographer, which I’ve been since 2012. Since about 2000, I’ve had a serious fascination with mechanical watches that in my mind always culminated in building my own watch. I went through the fantasy of complications, simplicity, new displays of time, form factors, and other materials and features. I researched, designed, drew, discussed, consulted, and eventually shelved the dream when work took over and left me with no time or passion to pursue it. But I’d still attend events, trawl forums, say hello to the legends whenever a chance presented itself – and occasionally buy something. My modest collection included a good body of timepieces by Jaeger-LeCoultre, Omega, and Sinn because they represented good value and an aesthetic that appealed to me. But upon buying my fourth Reverso (the elusive blue guilloche Latitude model) I think I probably had had enough. My early photographic career involved clients from the watch industry simply because I had those contacts and had developed something of a style while photographing countless pieces owned by fellow collectors; I photographed watches because that was the only way I could really afford to enjoy the more serious pieces. Later on, I was able to buy some of the pieces I had lusted over in the early days of my horological obsession: they were now good value on the secondary market, with the added bonus of having survived the test of time and my own personal vagaries of taste. But there were only a small handful of those: the Jaeger-LeCoultre Reverso Latitude and Gran’Sport Chronographe; the aluminum Girard-Perregaux F1-047; a Speake-Marin; and a base titanium Panerai PAM 176. And while these were special to me, they were not really that special in the grand scheme of things. And having worn them for longer periods of time, I began to see things that annoyed me; proportions that were off, crystals that were too reflective, strange strap sizes, weak luminous material, spongy reset pushers. The list was endless. Either that or I am simply a malcontent, which is also possible. Family and business priorities meant that watches took a backseat until some serious collector friends asked me to join them for Watches & Wonders 2014 in Hong Kong. We duly went and were duly horrified by the tactics used by some of the brands on potential customers. In my opinion, it was more like a flea market with six-figure entry prices. A watch – especially a high-end timepiece – is a purchase that is far from being a necessity. It is a discretionary luxury that should make you feel good when you put it on. There should be positive emotions from the whole buying experience, especially when the piece in question is a perpetual calendar tourbillon or something of that level. I am sad to say that one recent trend I’ve noted has been that service has really declined. Perhaps this is only in Asia, but it’s made me walk away from buying pieces on many occasions in the past. There are still a few retailers who get the buying experience right; (in Malaysia, at least) The Hour Glass is one of them. I don’t know about you, but I certainly cannot bring myself to hand over that kind of money to somebody who is borderline rude – for something that I don’t even need! Please excuse the long introduction, but I thought it helpful to explain how I got here. On the return flight from Hong Kong, my group started discussing independent horology. It’s something none of us were any strangers to; I also own a couple of Speake-Marins and a Maîtres du Temps Chapter Three. By and large, we’d all had very positive experiences. Peter Speake-Marin and Steven Holtzman are friends and cigar-partners-in-crime whenever they’re in Kuala Lumpur. I do understand that is the exception rather than the norm, but it does leave a very positive feeling. Ochs und Junior came up in conversation at the departure lounge. I’d seen this boutique brand’s work before: a very, very early prototype with a custom movement by Paul Gerber on the wrist of another good friend. And then there was the MIH Watch, which always attracted me. But for various reasons – including size of my small wrists – I never bought one. I then loaded the customizer on the Ochs und Junior website before boarding, and by the end of the flight I had a working concept of something I wanted to explore further. I liked the philosophy: engineering refinement, but with the goal of simplicity to improve reliability and distill the watch down to its essence. There is nothing unnecessary on an Ochs und Junior timepiece: a reliable movement is chosen – Sellita or ETA – with additional parts machined from solid grade 5 titanium by Peter Cantieni, who makes parts for the Sauber Formula 1 team. Finishing is functional, not decorative. This is hugely antithetical to the traditionalists, but if it means that money is spent to adjust my watch to run five zeros on the timing machine, why not? Fast forward several months and many emails, and I was ready to collect my first (three) watches. Yes, three. I started with an annual calendar for myself. Then thought that I should get one for my wife, too, seeing as we tend to somehow end up with matching watches. And another friend wanted the two-time zone watch, which had another customization I conceived. At the swipe of one credit card, Ochs und Junior went from zero customers in Malaysia to us taking two percent of its annual production. I was in Venice for work and took a train to Lucerne to visit the workshop and meet the team. Beat Weinmann had been every bit as responsive and accommodating as his reputation and the brand’s website leads us to believe, if not more so, and he spent the whole day with us talking about a massive range of subjects from photography (his wife is a photographer) to leathers (more custom straps!). I commissioned the first watch both as an experiment to see how it would turn out – not having seen any of Ochs und Junior’s more recent pieces in the metal as nobody in my country or greater circle of collector friends owned one – and to see if the experience would be enjoyable. As you can probably guess, I was hooked. Here was something unique, special, and meaningful to me. And it was a watch free of the feeling of delicacy or fragility that would prevent me from using it every day in every situation. My annual calendar is about as minimalist as it gets: just an indication for date and month. The day indicator is removed, and that caused some unexpected problems because that wheel is actually part of the extremely simplified calendar mechanism that possesses just five components. My wife and I have a stuffed polar bear that has some significance to us (another story for another time) . . . and the watch’s entire color scheme and “nose” at 8 o’clock is part of that. On the 21st, the two day indicators fill an expanded pair of oval indicators to make “eyes” for the bear. The red hands form the scarf. The problem with having the option to tinker with something is that once you start, it’s very, very difficult to stop. And after a couple of months of wearing the annual calendar, I found there were things I wish I could change or would want in a new watch. One of the nice things about Ochs und Junior is that you can actually go back and put in new parts later; however, I elected not to in order to keep the harmony between my watch and that of my wife. Clearly, there was only one solution: it was time for another watch. Now that I had some indication of the company’s capabilities (“if it can be machined, we can do pretty much anything; there are other things that are handled by partners like coloration and printing”) and a relationship with Weinmann, I decided to push the limits. I suspect somewhere along the line, he may have regretted promising “open-ended customization” – hence the “except for Ming Thein” joke in all of the renderings. Ochs und Junior’s signature watch is arguably the moon phase (Selene); it includes both the date snail and Ludwig Oechslin’s highly accurate moon phase indication (see The 8 Most Accurate Moon Phase Wristwatches Today). Like the annual calendar, it also has an extremely reduced number of components: the dial is part of the moon phase gearing with teeth in its bottom surface. It also appealed to me because there was a large scope for customization. There is something romantic, yet utterly pointless about a moon phase indication – more so when the claimed accuracy is better than the accuracy to which you can set it. Yet, I’ve always wanted an astrolabe-type watch, even if the Pluto ring won’t appreciably move during your lifetime – much less your likely ownership. But some motion would be nice. Here’s where my crazy ideas came together: the moon was a good starting point, and with a 15-day rotation period (displaying new moon and full moon) it would change enough from day to day to be interesting. The second hand could then be replaced with a disk representing the earth – since the moon orbits the earth in reality, it would also make sense to do so on the watch. It’s even domed and has two asymmetric matte green dots machined in to represent countries, and gloss blue for water – on a component that is barely 4.4 mm in diameter. The date dot could be an asteroid or something. And the 12 o’clock marker – why not make it a sun? A glowing, warm, satin-brushed copper orb of a sun. There were other things I wanted, too: hands that appeared to float and then line up to make a new shape when they overlapped at certain times of the day (they form a cone that represents earth’s wake through the solar wind). There’s plenty of luminous material for easy reading at night; in fact, I’ve always wanted to see luminous arcs with gaps for markers instead of luminous markers and big gaps. It seemed that it would be easier to read at night. I’m glad to have been proven right. And it would have to be a dark-colored dial reminiscent of space, but perhaps with something a bit more than just plain black. The case and hardware would have to be something a bit special, too – I wanted the irregularity of heat-bluing, and preferably on titanium. There’s this very unusual blue-purple color that the door latches of some airplanes carry, and that you find on parts that have encountered very high operating temperatures: This provides a nice technical link between the concept of space and the hardware of space. At one point I even thought about getting a meteorite and heat bluing that, but I was advised against it because there would be no way to ensure there were no structural weaknesses or inclusions before cutting it. Finally, it would have to carry two little things for me: the stylized polar bear and my name. Surprisingly, the latter point proved to be a bit of a sticky one for Ochs und Junior, which is perhaps the most anti-branding watch company ever. As a result, its makers have created a brand without a brand; putting a client’s name on the dial is completely at odds with that philosophy. And, given that most models are created using its online configurator, anybody else can make one too – which doesn’t end up making them exactly unique. This is admittedly unlikely given the thousands of possible “standard” combinations – the firm makes just 150 or so watches a year – but fair enough, given that the design really isn’t the product of the client in that sense. I had a long discussion with Weinmann about this, and he eventually agreed to allow me to have my name on the dial – because in this case, the watch really would be a one-off and because I did all of the design work for the dial, hands, case back, and other parts. It was actually a very interesting exercise in design, too: how do I preserve the company’s own signature style while injecting enough uniqueness to make it clearly my own and to reflect some of the previous design work I’d done? Later conversations with Weinmann confirmed that he would not have agreed to produce it if what I wanted strayed too far from Ochs und Junior’s own philosophy; I think at times it did but he was diplomatic enough to steer me back on course without an outright no. In order to incorporate the elements I wanted, several new processes had to be developed for my watch. Multiple cases were ruined trying to get an even blue; then it turned out the alloy composition of later cases changed, and these would not blue at all. In the end, the parts were coated using a DLC process by a medical implant company. Needless to say, they’re even more hypoallergenic than regular titanium – and they could match an exact Pantone color to boot. The case also has the unique property of changing color when touched thanks to the natural oils in skin; it appears to take on precisely that blue-purple-grey heat blued hue I was aiming for initially. This is extremely difficult to photograph and perhaps best conveyed by the hand-in-pocket shot above. The dial is not quite as it seems: the luminous tracks are actually machined then filled; they are clearly lower than the surface of the dial, which is itself irregular and textured much like an asteroid surface. The machining process for the tracks was new. 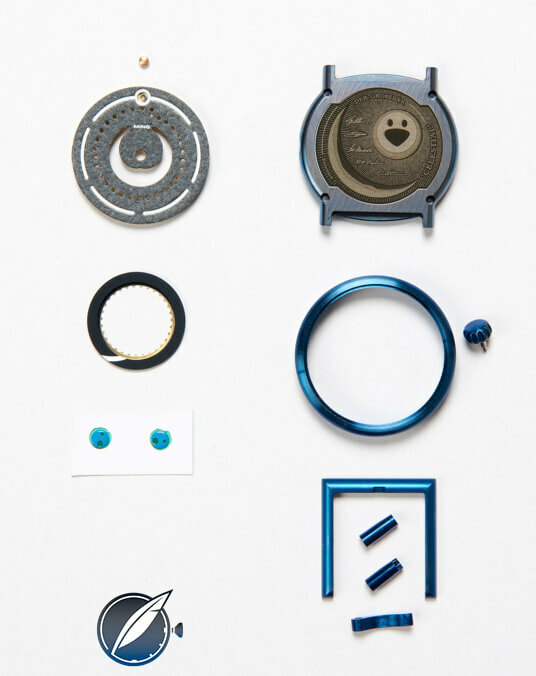 The base color of the dial is close to midnight blue, but there is a textured gloss layer applied on top of that which is full of silver, gold, and platinum dust. The resulting color of the dial shifts everywhere from a flat battleship grey to a metallic, rippled, textured, sparkly thing to a midnight blue depending on the light. Sometimes it appears lighter than the case color, sometimes darker. This is one of my favorite aspects of the watch. The case back carries a laser engraving – but one that has different levels of relief and different shades of grey. It was performed on the case after bluing, so the engraving is grayscale but the rest of the case is blue – in one single piece of metal. It carries a sun-moon design of my own, surrounded with the name of the piece (“The Celestial”) and the signatures of the team that created it: Ludwig Oechslin, Beat Weinmann, Sandra Flück (the watchmaker), Peter Cantieni (CNC master), and myself. The crown is not the standard one used at Ochs und Junior; it’s more ergonomic, fits the style of the case better, and actually comes from a future model. Finally, we all know that the right watch needs the right strap – and selecting the right color was a little tricky until I saw the watch in person. Most of the images show the watch on a dark blue calfskin strap, though I am now wearing it on a specially dark-tanned sturgeon (another Ochs and Junior specialty) that’s a deep red-brown, rigid but supple – and waterproof. It carries blue stitching that matches the color of the case and buckle. I designed this watch to be four things. Firstly, a personal reflection with elements that appeal aesthetically to me and reflect some of my earlier design ideas. Secondly, visually unique with a different personality under different lighting conditions. The luminous signature is very unusual and legible, but completely different to how the watch appears in low light, diffuse light, or direct harsh light. There are elements of the design that do not manifest under the “wrong” light conditions – when you won’t see the asteroidal dial texture or color or metallic tinge, for instance. Or the color, or the curvature of the spherical sun sitting inside its recess like a gravity well. Or the fact that the luminous material is actually at a lower level than the rest of the dial. The hands only do their magic at overlapping times, and the polar bear in the moon only shows when it’s full moon. The sapphire crystal has a double antireflective coating for visibility and transparency. Thirdly, it has to be something I can wear every day; there’s just no point otherwise. No finishes that would easily mark or scratch, and including a strap that would age and patina nicely with use. The final thing – and this is perhaps novel – but since I’m a photographer, I designed it to be photographable and to look good under pretty much any angle and light. Oddly enough, this also means it looks great to the naked eye. Evidently, my seven-month-old daughter thinks so too: it’s the only one of my watches that both holds her attention for more than a few seconds (she can stare mesmerized at it for minutes, which is great in the absence of a pacifier) and that she likes enough to eat. Due to the complexity of the various processes and the challenges faced, the delivery date experienced some slippage – but still, less than five months from green light to delivery for a 100 percent one-off custom watch is outstanding. Once again, I was lucky enough to be in the right part of the world at the right time, and I made a small detour to Lucerne to collect the watch on my way home from an assignment. My collecting journey has been a strange one. There have been various aspirational grail pieces at different points in time – the Datograph by A. Lange & Söhne for the longest period – but the funny thing is, offered the chance to acquire one at a price that would only cost one kidney, I passed. It was more the experience than anything: I knew what ownership would be like thanks to a generous loan from a friend (see The Datograph Diaries), however the buying experience really, really put me off. I have never met such arrogant and unfriendly salespeople in my life, much less ones trying to sell me a very expensive watch. That business has since closed down, which, frankly, I think is deserved. I always thought that I’d end the journey – some decades from now – by acquiring something rare, complicated, and carrying a big brand name. What I never figured was that I would experience the joy of getting everything precisely to my liking in a much simpler, more reductionist philosophy with a comparatively pedestrian movement – but including a very interesting complication and aesthetic. I certainly never thought the end result would carry my name on the dial, nor that it would always make me happy when I strap it on or look at it. Would I buy another watch? Sure. But I think it would likely be another custom piece. A serially produced model would just carry too many things that would irk me that I know can be rectified. I’m going to finish this little story with two pieces of advice I’d give any potential custom watch commissioners in the audience: firstly, give the design time to mature. What may seem fun at the start may fill you with regret later, much like a novelty tattoo. I went through four key versions and countless variations of them – you can see some of them in the work-in-progress images here. Some changes are subtle, but necessary. Designing something at screen size is one thing, but seeing whether the details work at wrist size requires some shrinkage and simulation. I recommend putting them on your phone and over your wrist. Secondly, consider hiring a designer to translate your ideas instead of doing it yourself. I am reasonably proficient with this kind of thing so I did the work myself, but it’s important to know the properties of the materials you’re working with and factor that into the design. It’s also much easier to have an accurate mockup since at least you can be more confident about what you’re going to get at the end of the process. My recent experiences with both mainstream brand and mainstream retail as well as independents have led me to wonder about the future of luxury itself: what is the point of having a watch that is merely expensive, or complicated, or jewel-encrusted? It requires money – in some cases, a lot of it – to be handed over for the ownership experience, which is a barrier in itself, but does not distinguish the taste of the owner. Nor is it any guarantee that he or she will in turn receive something that is truly special and unique. Visible, conspicuous-consumption luxury is for those who must have fashions decided for them by arbiters of taste. However, I increasingly think the meaning of true luxury is really the freedom of choice: your ability to have something customized to your personal preferences and yours only. To hell with what the world thinks: frankly, I take a perverse pleasure in knowing that only a few individuals have any idea of the story behind my watch, and all of them are also important people to me. I can say that the process was long and required a lot of work on my part, but every moment was truly enjoyable – and I have nothing but positive associations and memories with this watch. Surely there can be nothing better than that? For more information, please visit www.ochsundjunior.ch. Ming Thein is a watch collector and commercial photographer. He also manages a large and active photography community at www.mingthein.com. About double a standard one, give or take a bit. I would imagine quite a bit more if you had to find somebody to do the design work for you. That could certainly be arranged – shoot me an email and we can discuss it offline. Ming, a small enquiry a long time after this article was written (and probably forgotten!) You mentioned a small wrist – are your watches based on the 39mm or 42mm case? 39mm, other than the Simpleton, which is a 40mm. Thanks very much for the interesting lecture. I would be interested to understand why you never considered the MIH watch. The reason why I ask, I had the opportunity to meet Paul Gerber a couple of times and I believe he is a watchmaker by heart with extraordinary ideas and somebody who can put those ideas into mechanics. 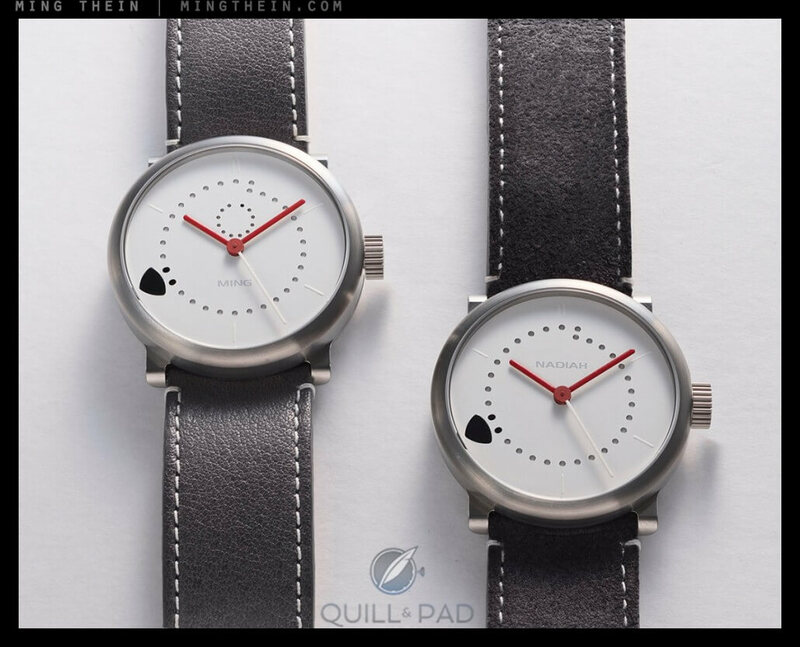 Looking at the watches that Oechslin produces today, I can clearly see the starting point, at least from a design perspective, with the MIH watch. On that design also his current watches are based on, the mechanics are extraordinary, but almost side product. The MIH is probably a compromise between innovation, design and price. From a historic point of view it’s a milestone, two very extraordinary characters created something very unique and new at that time. I agree on the technical front, but simply not my preference aesthetically.